Abandoned factories often look to me like abandoned castles: grandiose in size, with silos resembling turrets, and ominous defensive structures of unspecified purpose left to remind us of days long past. 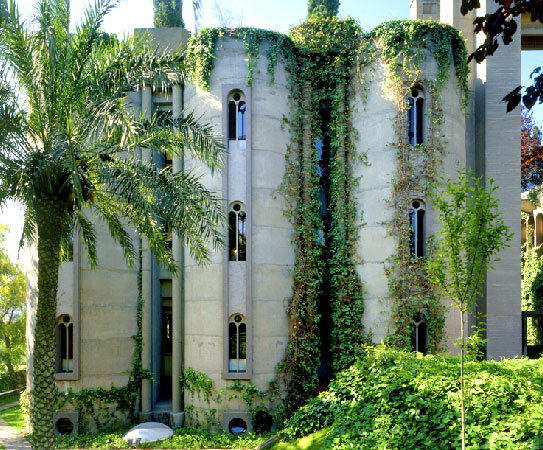 Perhaps architect Ricardo Bofill shares this idea -- in 1973, he purchased an abandoned turn-of-the-century cement factory in Barcelona and commenced a two-year renovation to transform it into a spectacular architecture office. Simply dubbed the Cement Factory, the complex hosts Bofill’s architectural offices, archives, a model laboratory, exhibition space, his personal apartment, guest rooms, and extensive gardens. 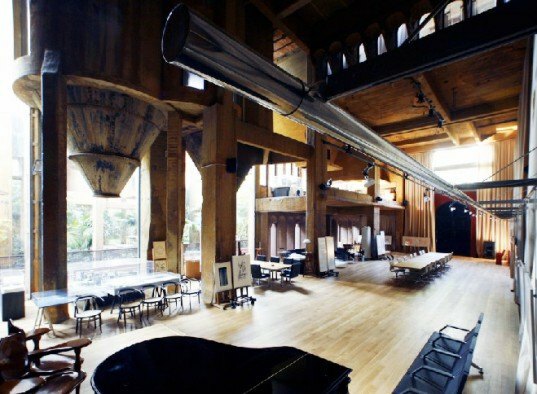 The property was originally comprised of 30 silos, gigantic engine rooms and many underground structures. However Bofill’s renovations look as if he simply shaved away part of the existing structures, removing certain elements and buildings to reveal previously unexposed textures beneath. The factory possessed both Brutalist and Surrealist elements, which Bofill used as inspiration. The harsh silos were planted with ivy and transformed into The Cathedral. The factory’s front lot was planted with beautiful gardens, which include eucalyptus, palm trees, olive trees and cypresses. Bofill embraced the factory’s cavernous rooms, leaving many of the interiors at their original two and three-story ceiling heights. Interior structural receptacles, once used to contain who knows what, hang awkwardly in the vast voids throughout, creating tension within the space, yet they are so enormous in scale that one cannot help but feel disoriented. The complex’s main building has been renovated into Bofill’s personal apartment. The interiors throughout have been kept simple, letting the architecture do the talking. White slip-covered sofas, canvas sling chairs, oriental carpets, framed architecture prints, and simple leather upholstery create a muted palette so that the structural and architectural elements may sing. The greenest buildings are those that already exist – rather than building from scratch, Bofill has transformed an abandoned industrial ruin into a complex with the magic, wonder, and grandeur evocative of a historical chateau. Thats not just logic. Thats rlealy sensible. You've hit the ball out the park! Incerdible! I love to see how a monument of failed production has been transformed into an area for creative work. Thanks. This is simply unbelievable. How inspiring. Stunning. I've never seen detestable Brutalist architecture transformed and softened like this it to make it graceful and elegant, and above all, human again. Thank you for a great article. Very impressive. I was planning to find a warehouse to turn into a home/ business. You just gave me a great idea though this is for sure not a cheap undertaking - yet either way it is inspiring and mind opening. The factory possessed both Brutalist and Surrealist elements, which Bofill used as inspiration. The harsh silos were planted with ivy and transformed into The Cathedral. The factory’s front lot was planted with beautiful gardens, which include eucalyptus, palm trees, olive trees and cypresses.